Embroidery is going to be everywhere for spring summer, and I am thrilled as it's always been one of my very favourite embellishments. Some high street stores already have this trend on jumpers and jackets, meaning you can start incorporating it into your late winter wardrobe too - perfect transitional pieces. This jumper is from Evans, and is a great update on a plain black jumper. I am wearing it here with my Maddy jeans from Studio 8 (hands down my favourite jeans at the moment) and some biker boots. The jumper is a 22/24, and the jeans are a 24 (I have to size up because of my big lower tummy). This outfit was actually my first post of the year (you can read it here). I have gotten a lot of use out of this skirt already, and will get even more when I go back to work and stop living in pajamas every day! And now that the weather is a little more decent, the gorgeous velvet trench is getting loads of wear, and it's currently in the sale! In January I decided I wanted to move a bit more. Because exercise - even a little bit and trust me that's all I'm currently up for - releases the much needed endorphins to battle my mental health demons, and I also find it's a good way to feel more connected to my body. I have just been taking long walks around Battersea Park (which is just down the road from me) and stretching myself a little more every day. I am really enjoying this time outside, by myself, moving. But the endless dilemma of workout clothes. 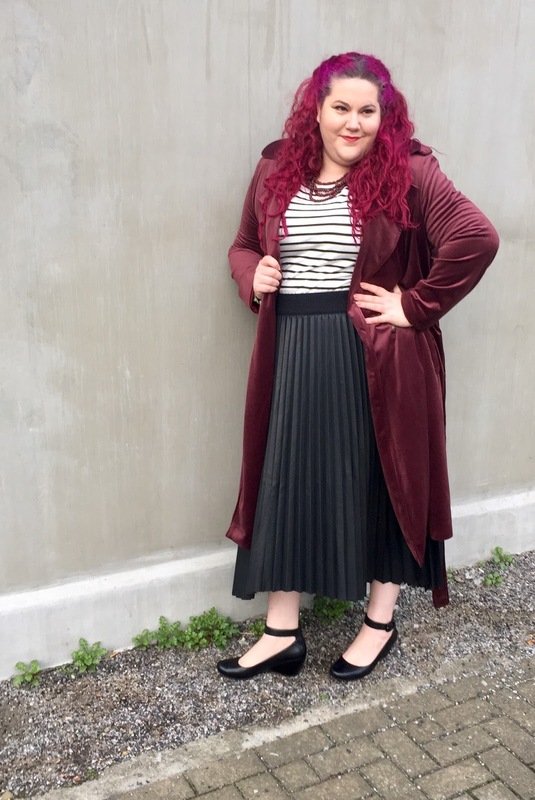 As a plus size person, the options are usually deeply uninspiring, so hurrah! Evans have brought out a revamped collection of active wear and it's rather lovely. These were my fave pieces from the new collection - a hoodie and leggings which match but are bought separately. I love the on trend floral panels on both items, that just make this set fun and feminine. The hoodie has pockets to the front which is great for a phone and some keys which aren't going to pop out if I'm just walking. I ordered them both in a size 22/24, which I found to be a really comfortable fit. Unlike with a lot gym clothes the hoodie is cut quite long, so you don't feel like it's going to ride up all the time, and the leggings have a deep waist that easily comes up over my tummy - imperative for exercise comfort! Over all I am ridiculously pleased with these pieces and couldn't recommend them more to exercising fatties everywhere! This jumper is just one of my favourite things at the moment. It's cute (and I am currently all about cute), it's soft and snuggly and it's got a cat on it! What more could a girl want for winter. I ordered this in a 24 from Joanie's Clothing (if you haven't checked them out yet, you need to) and it's a comfortable fit. I probably could have sized down and had it even snugger, but I like a slightly looser vibe on jumpers. But, warning, it is VERY short. Like it doesn't quite reach my belly button! I am 5'8 with a long torso, but still. That's short, especially for plus size. So personally the only option with this jumper, for me personally, is to wear it tucked into a high waisted skirt. Like I said, I think Joanie Clothing has some really cute and fun options for plus size, but be careful with sizing and read reviews where you can because fit is still a bit hit and miss with this relatively new brand. What is a montly outfit round up without a Dolores Doll dress? I am not sure I have ever had one, as I am not sure there has been a month since I started blogging when I haven't worn one! 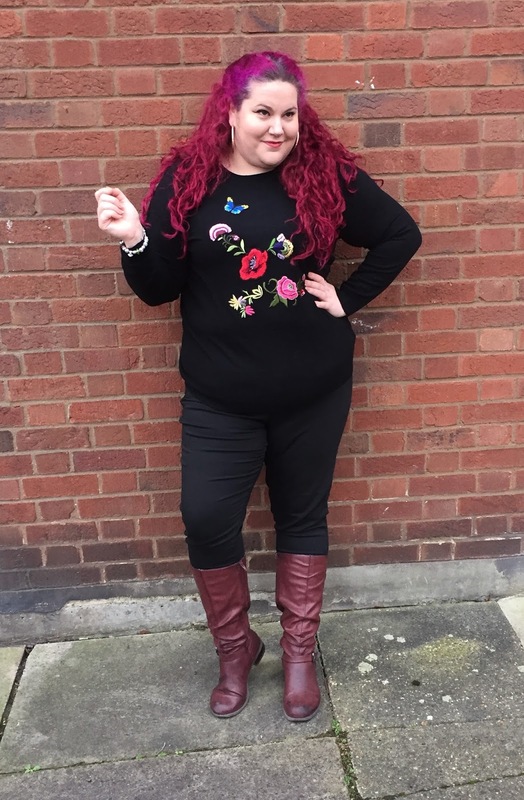 This one is my new favourite, and you can read my review (and some thoughts about body positivity wobbles) here. You know when the planets align, and you somehow manage to find something fun, cheap and easy to wear? That's this bloody brilliant dress from Boohoo. It's basically a giant t-shirt with a frill and I am currently living in it! Add tights (or leggings) and boots and you're done. Casual dressing 101! (Also - how cute is my headband? My mum crocheted it and I love the green with my hair). If you follow me on social media, you will be pretty familiar with how much I love my parka from Studio 8. New converts are always the most zealous, and that's certainly true in my case - I never knew I would love a more casual coat this much. But I have lived in it throughout January, and it has kept me happily warm and dry I am pleased to say. You can read my full review here. I used to wear maxi dresses all the time, and still gravitate towards them in the summer, but it's rare you find a long dress that's winter appropriate. This piece from Elvi is wonderful. Full blouson sleeves, on trend lacing to the bodice, and the floaty chiffon makes it wonderfully bohemian and when I wear it I feel like I am channelling Stevie Nicks and Florence Welch, which is no bad thing! And if you want to be a boho hero, then you can grab it now in the sale! There's some of what I wore in January (I also wore PJs a lot, because... unemployment) and if you want to see my #ootd posts on a more regular basis you should follow me on Instagram or Twitter. The Joanie whiskers are as adorable as your face (well, almost).